All players — do NOT upgrade Uncommons/Rares. Low levels/BSIs — upgrade Commons. You get more power per alloy/cash used, which are harder to come by for you. Mid levels/Hybrids — consider upgrading a mix of Commons and Epics. High levels/LSIs — if you have an ample supply of insignias, alloy, and cash, forget the Commons. Only upgrade Epics. Last edited by Selene; 05-31-2015, 03:36 AM. A given insignia type has a specific main stat. Infinity can have any one of the three main stats. The primary attack, defense, or health bonus depends on insignia rarity and level. Level 9 is a turning point; every level before it increases the main stat by 1, and every level after it increases the main stat by 2 for non-epics, 3 for epics. Last edited by Selene; 06-12-2015, 01:43 AM. A given insignia type has certain possible sub stats. The number of sub stats depends on insignia rarity and level. Every five levels grants additional sub stats. Neither insignia rarity nor level affects the strength of an individual sub stat. Instead, the sub stat value falls between a certain range. Because all sub stats are randomly generated, they will converge on averages. Last edited by Selene; 06-14-2015, 12:20 AM. These are the alloy costs required to upgrade an insignia to the displayed level. These are the cash costs required to upgrade an insignia to the displayed level. These are the total rounded amounts of alloy and cash required to upgrade a level 1 insignia to the displayed level. Because there is a chance for an upgrade to fail at each level, the actual total cost will be higher. For each insignia rarity, there is a cost ratio to the highest (epic) cost. Special thanks to analytical for providing data. Important Note: These tables have not been finalized. Due to missing data, rounding, extrapolation, and the 25% cash discount, some of these values may not be precise. If you see anything incorrect, or can verify the accuracy of a cell/row/table, please let me know. Last edited by Selene; 06-01-2015, 02:21 PM. Your personal build/class should determine the type of insignia to pursue (Fury/Blood/Aegis/Vanguard/Beast/Infinity). However, the question remains: which rarity should you upgrade? To answer this, we must calculate the cost effectiveness of each insignia rarity. Ideally, you want the greatest stat boost for the smallest amount of alloy/cash possible. There are three core attributes we define to perform a cost-benefit analysis. Power Index — A rough approximation of the strength of a level 15 Common/Uncommon/Rare/Epic insignia. Calculated by (Level 15 Main Stat) + (3x Max # of Sub Stats). We multiply the sub stat by 3 because this is the average # of SPs added per sub stat, excluding percent boosts. Cost Ratio — Expresses how much an insignia of any rarity costs to upgrade, relative to an epic insignia. Cost Effectiveness — Power index divided by cost, with epic defined as 100% cost effectiveness. Higher means better. 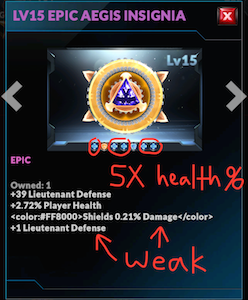 The conclusion we reach is that Common insignias are most cost effective. 120% means you gain about 20% more stats (both main and sub combined) when you upgrade Commons instead of Epics, with the same amount of alloy/cash spent. Of course the ultimate goal is always epics, because in the end you should try have to have the best insignias equipped on your core LTs. Epics are still the strongest—they're just more expensive per stat than Commons are. Last edited by Selene; 05-25-2015, 10:17 PM. I made a list of the gold and alloy costs, but before I could finish the table, they changed the costs. The one Epic that I got to Lv15 was $18 mil. I've seen a sub-stat repeat - like if it's LT Attack for the first one, it might also be LT Attack again later. If I'm reading the chart right, Selene, it's inevitable sometimes. There are only 4 different possible sub-stats for a Fury insignia. The Rares have 5 and the Epics have 7, so they are bound to double up at least some stats for a non-infinity insignia. Could you send me that list if you still have it? They could still be useful because according to the devs, the cash costs dropped by 25% across the board, while the alloy costs stayed the same. First thing I noticed was the five health % boosts. As you can see these 5 sub stats are combined under one number—2.72%. If you divide 2.72% by 5 you get 0.54%, which is higher than the average (0.5%). So this insignia is somewhat strong in terms of health %. However, the other two sub stats are very weak. 0.21% shield is close to the minimum possible shield, 0.2%. And +1 LT Defense is the absolute lowest possible value for an LT Defense + sub stat. Overall this defensive insignia has pretty bad sub stats, unless you have a lot of player health. Of course it's still an excellent insignia to have (+39 defense main stat), but it's not the best, so you may not want to equip it on your top LT.
Last edited by Selene; 05-22-2015, 09:48 PM. Because the main stat and number of sub stats depend on insignia rarity and level—both of which you can control—the only random factor is the strength and type of each individual sub stat. 2) strong sub stats (above average/leaning toward the maximum). This insignia is very strong for an enforcer. It has five LT Defense + sub stats, which average to +4 each (fairly high). The Health + sub stat is maxed at +5, which is exceptional. And the 0.23% shield is just below average (0.25%). Overall this Level 15 Epic Aegis is definitely a keeper. Yep, good work Selene . After a little muddling the first couple of days with a few refills and drops I saw the way I wanted to go, this post makes it so I don't have to think so much so thanks. Damage % then the two crit abilitys is what I hope to have eventually! infinity insignias baby! he'll yeah! What's the best site you lot use for uploading screenshots? As I'd happily share a screen if I get my favourite stats. Imgur.com works well for me. Use [img][/img] tags to insert without having to do an attachment. Added an Upgrade Cost section with tentative table values. Because I didn't have data for everything, I used surrounding data to fill in missing cells, which produces inaccuracies. So if you see anything wrong, please shoot me a PM or post here. Can someone double check if the cost to go from level 2 epic insignia --> level 3 epic is $731k? I'm seeing $731,250 (plus 147 alloy).